Former defence Minister Geoffrey Mwamba has reminded the Patriotic Front not to forget where they are coming from and how his business suffered at the expense of sustaining the then opposition party. Speaking to Qfm News in a telephone interview, Mr. Mwamba says it is unfortunate that the ruling party has easily forgotten its past. Responding to reports that government has directed the Food Reserve Agency to immediately cancel his tender for transporting farm inputs using his Arizona Transport, Mr. Mwamba wondered why his family business has to be involved because of his resignation. He explains the Patriotic Front and President Michael Sata should remember that his family businesses suffered at the expense of sustaining the Patriotic Front while in opposition. Mr Mwamba adds that God almighty is watching and will fight the battle for him. 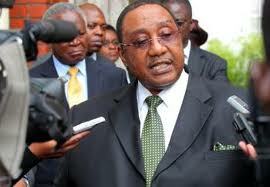 Mr. Mwamba says the PF should not drag his family business into politics. Mr. Mwamba adds that Arizona transport is a company for his children and his wife, the reason why it should not be dragged into his political battles. This is not good at all. He was asked to make a choice between his job and HRH Mwinelubemba Chitimukulu and GBM surrendered his job for his grandfather,now what has this got to do with his business. Quarreling is not the solution to any problem resigning on moral grounds or disagree with certain instructions involving governance is the best thing to do if you are a leader. This thing is happening all over the world it has not started in Zambia even president Nixon of the USA resigned over Watergate scandal. Leave GBM and his family do their business freely. He just did well to exercise his right as a leader and free citizen of this country. Kuti aloloko. Abasonkele impiya ku PF bengi sana. It wasn’t only showoff GBM. Guy Scott also donated billions. I can’t believe this, separate business from politics, leave his businesses.